You’re the parent. You’re the boss. You make the decisions for your family. Right? Well, food marketers have noticed that there’s a very influential lobbyist, of sorts, in your midst: Your child. Children have an impressive repertoire of tactics to convince their parents to make purchases, including whining, crying, pleading, arguing, pretty-pleasing. Even the most stalwart of parents become weathered and worn down by these tactics at times. The problem is, children aren’t choosing their preferred products based on what’s good for them, or even based on what tastes good. Food marketers have realized kids can be “bought” by their emotions. When a child watches a movie or a TV show with an admirable character in the lead, they identify, emotionally, with that character. The character becomes a part of their lives, someone they adore, someone they imitate, and someone they trust. 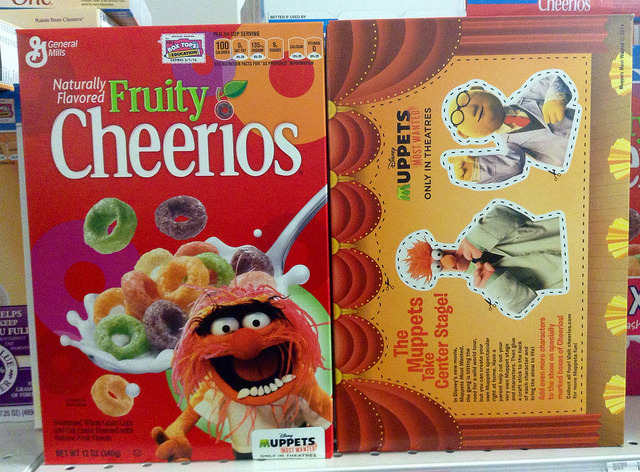 A Cornell University study is exposing just how carefully marketing executives are designing product packaging (specifically cereal) to make absolutely sure your child gets the message they want them to get (usually: Buy me!). 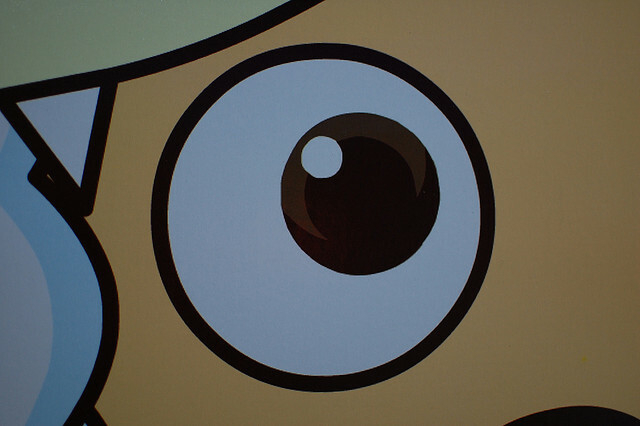 The study shows that cereal marketed to kids dons characters with large eyes that are pointed down, towards the eye-level of your child, and perhaps more alarming – that it works. The practice is seen to build brand trust and loyalty. “Findings show that brand trust was 16% higher and the feeling of connection to the brand was 28% higher when the rabbit made eye contact,” says an article from the Food Psychology Department of Cornell University. Some healthy food manufacturers are interested in using the same tactics to sell healthier foods to kids. Problem is, if the practice is acceptable in the healthy foods aisle, it will be acceptable in the chips & dip aisle too. What we create is a thick, nearly impassible wall of marketing to kids. On the other side of the wall, is our ability to teach our kids healthy eating habits based on nutrition, calorie needs, and taste (not just artificially-enhanced flavors, but the taste of an actual whole food!). We don’t accept manufacturers using cartoon characters on cigarettes, alcohol, or power saws. Of course, we can tell our kids “No” and we can explain why they can’t play with a circular saw, and we can teach them that cigarettes are unhealthy. But, we don’t accept marketing these products to kids because it’s just wrong. We should be less accepting of these methods in food marketing as well, no matter the food. Additionally, you might consider supporting this organization: Campaign for a Commercial-Free Childhood. Follow them on twitter: @commercialfree and Like them on facebook! This entry was posted in Children, Family, News and tagged brand loyalty, brand trust, branded characters, calorie needs, cartoon characters, cartoon eyes, cereal, commercial free childhood, Cornell University, eating habits, eye contact, Food Psychology Department, healthy food, marketing tactics, marketing to kids, MOMs policy, nutrition needs. Bookmark the permalink. I disagree with the premise of Commercial-free kids. Marketing is everywhere including built into the programs kids watch and so on. Instead, teach your kids to be smart consumers and to critique the information they are bombarded with. When my kids were small, as early as 3 years old we read labels together and I gave them guidelines about what was healthy. If they wanted Cocopuffs, we bought it, but with the clear understanding that it was NOT a breakfast cereal but DESSERT based on the sugar content…only to be consumed occasionally in small quantities like cookies. They are now in their 30’s and incredibly healthy young men and very smart consumers. I do agree that the best way to teach kids is at home, and in the store, with each purchase (and I hope nothing I said in the post misconstrues that). I also don’t think there’s anything wrong with drawing more attention and awareness to the modern state of food marketing to kids, and to support parents that would like more ability to teach their kids based on their own methods. Battling dozens of lovable and cherished cartoon and movie characters in nearly every single aisle in the grocery store is stacking the deck against the good guys. An interesting look at this topic that you might’ve seen but others may have missed is “Salt Sugar Fat” by Michael Moss (overview here http://www.npr.org/blogs/thesalt/2013/02/26/172969363/how-the-food-industry-manipulates-taste-buds-with-salt-sugar-fat) which looks at how major food manufacturers have changed their food and marketing since the 70s (and not just in the visible, obvious ways) – it makes me realize teaching kids healthy eating isn’t only about cookies and cereal anymore – even regular, stereotypically “wholesome” foods now have hidden sweeteners and additives. Kudos and high-fives to all the parents that are gracefully overcoming these obstacles. I hope we can change food marketing etiquette enough to aid more parents. Thank You very much for choosing my Creative Commons Picture! Mike Mozart of JeepersMedia on YouTube and Flickr!